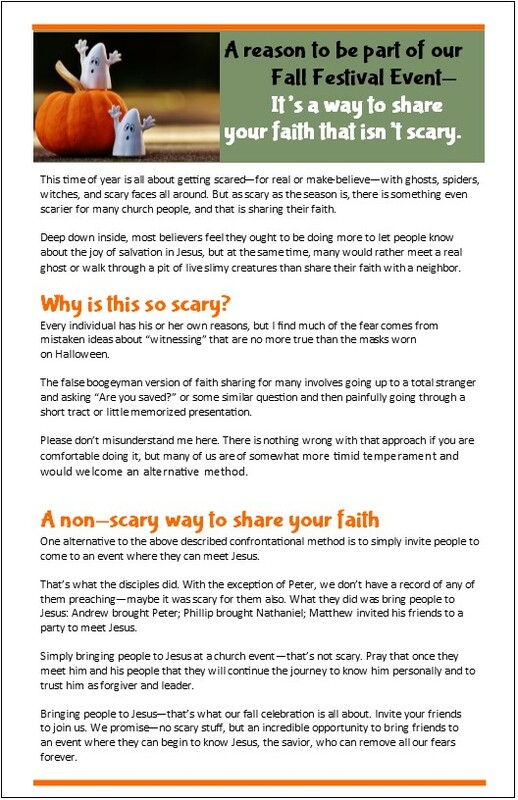 It’s a way to share your faith that isn’t scary. Halloween is all about getting scared—for real or make-believe—with ghosts, spiders, witches, and scary faces all around. 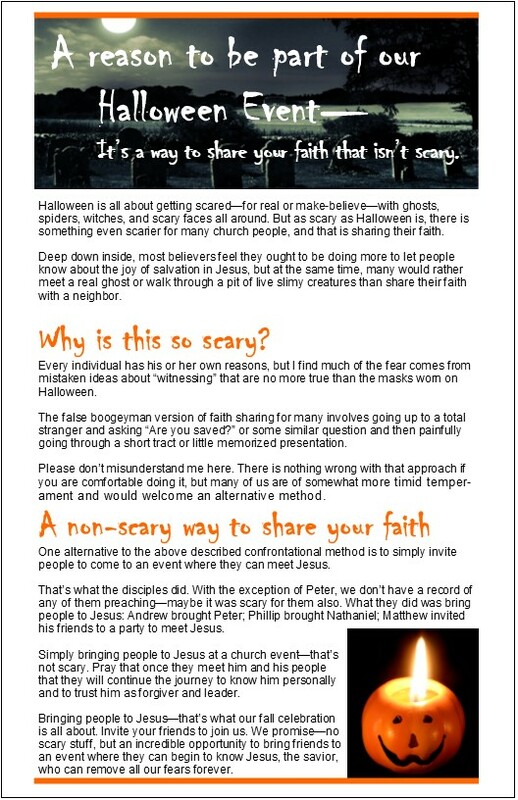 But as scary as Halloween is, there is something even scarier for many church people, and that is sharing their faith. Deep down inside, most believers feel they ought to be doing more to let people know about the joy of salvation in Jesus, but at the same time, many would rather meet a real ghost or walk through a pit of live slimy creatures than share their faith with a neighbor. 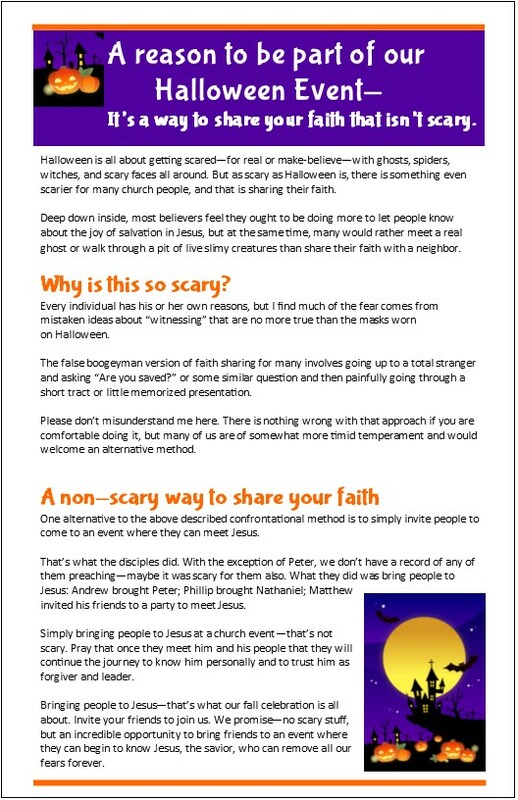 The false boogeyman version of faith sharing for many involves going up to a total stranger and asking “Are you saved?” or some similar question and then painfully going through a short tract or little memorized presentation. Please don’t misunderstand me here. There is nothing wrong with that approach if you are comfortable doing it, but many of us are of somewhat more timid temperament and would welcome an alternative method. One alternative to the above described confrontational method is to simply invite people to come to an event where they can meet Jesus. Jesus: Andrew brought Peter; Phillip brought Nathaniel; Matthew invited his friends to a party to meet Jesus. Simply bringing people to Jesus at a church event—that’s not scary. Pray that once they meet him and his people that they will continue the journey to know him personally and to trust him as forgiver and leader. an event where they can begin to know Jesus, the savior, who can remove all our fears forever.